A traditional Christmas dish in the Monti Azzuri (Blue Mountains), as the Sibillini are sometimes known, is Cappelletti in Brodo di Cappone. The cappelletti are hat-shaped tortellini stuffed with a mince made from veal, pork, chicken breast, mortadella, parmesan and spices. They are still hand-made, at least by the women in the rural areas such as Amandola. Lots of love and devotion goes into making the pasta, rolling it out, cutting it into suqares, filling each square then twisting it into the shape of a little hat (cappelletti). A broth is made by boiling together a capon, an onion, a carrot and a stick of celery. The broth is made the night before so that the fat solidifies and can be removed easily. 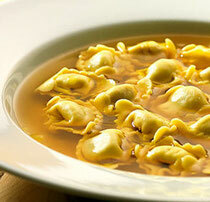 The cappelletti are served in the broth with freshly grated parmesan cheese.